The Adair County Genealogical Society and the Adair Public Library are celebrating Family History month throughout the month of October with special events and activities held each Monday night. 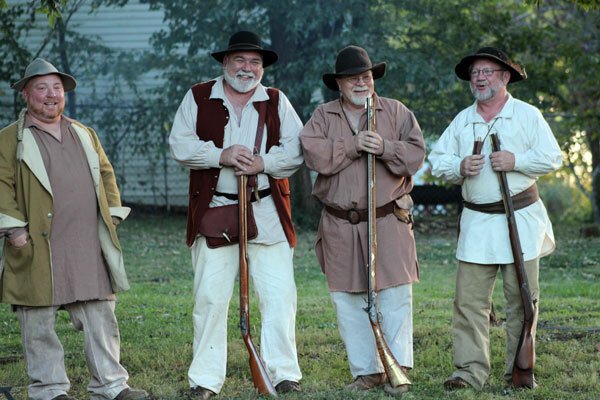 Steven Baker, Joe Vanarsdale, Barry Jones and Kenneth Bennett are all smiles after a lively reenactment of the Pelham Branch story at the Adair Public Library. This week, the lot near the library was turned into a primitive campsite as local participants portrayed Columbia’s earliest citizens and told the story of how Pelham Branch was named. 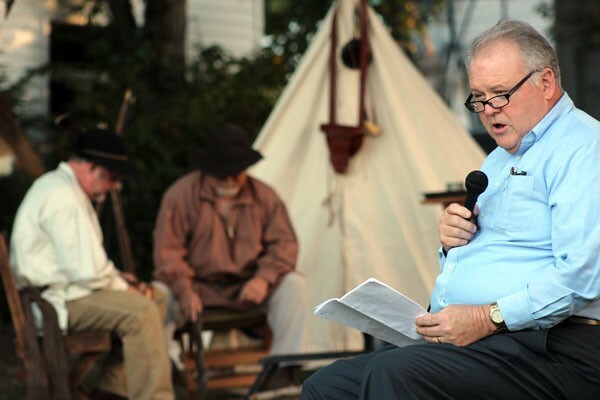 Through narration and a spirited reenactment, guests learned how a couple of suspicious, transient brothers with the last name of Pelham camped near the branch causing town folks to become concerned about their intentions. Col. William Casey and Nathan Montgomery were dispatched to the site to question the men and after an altercation convinced the men to leave town. Thereafter, the name Pelham became associated with the creek and it was eventually known as Pelham Branch. Richard Phelps tells the Pelham Branch story as Kenneth Bennett and Barry Jones portray the Pelham Brothers. The story, written by local historian Mike Watson, was narrated by Richard Phelps while Barry Jones, Kenneth Bennett, Steven Baker and Joe Vanarsdale portrayed the characters.